60th Inf. Reg., 9th Inf. Div. Co "C."
S/Sgt. Raymond "Carlyle" Blanton, right, and his siblings and nephew, left, the day they learned he was KIA. Uncle Carlyle had a twinkle in his eye and a sweet, selfless spirit. He was the seventh and my mother, Shirley Apperson, the youngest of the eight Blanton children, and they were very close. His death was the most devastating event in her life and that of his entire family. He died at 19, seven years before I was born. 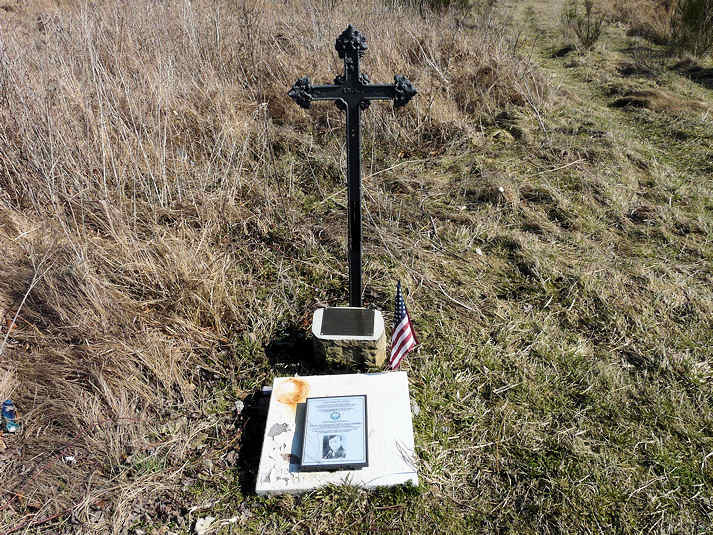 Sixty-five years later his family keeps his memory alive and may yet find his remains. 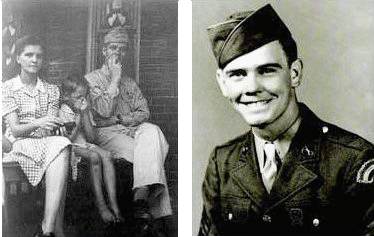 Drafted in August 1943, Carlyle trained with the 232nd Inf. Regt., 42nd Inf. Div. - The Rainbow Division - at Camp Gruber, Oklahoma. He was promoted to Staff Sergeant and reassigned to Company C of the 60th Inf. Regt., 9th Inf. Div. - The Octofoil. 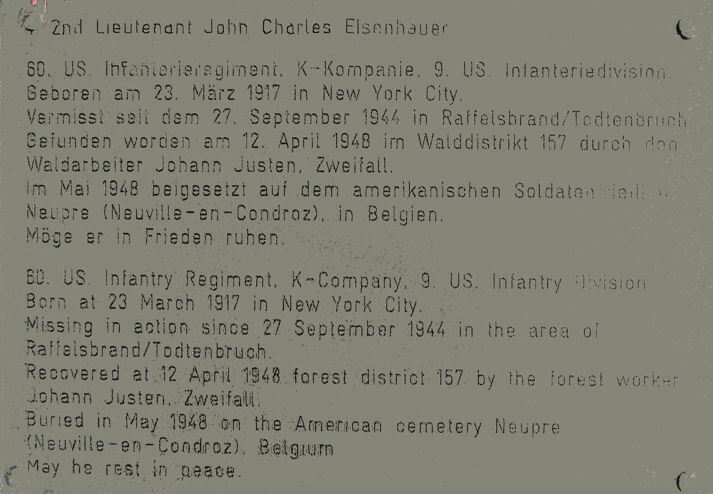 He went MIA in the Huertgen Forest in Germany on October 14, 1944. Mom told of a premonition weeks before the telegram arrived. Carlyle had come to say "Good Bye." As a four-year-old, my cousin Ira "Sonny" Smith remembers the actual day the telegram arrived. Little explanation was provided about how or where he died. There were no remains, funeral, grave, nor place to mourn. His father died the next year. His mother wrote many letters to the Army, eventually receiving only his prayer book and a testament. With a Finding of Death the Army doesn't issue an official discharge, so several of the medals he'd earned remained unissued. The family lore passed down was "the platoon stepped on a mine leaving no remains." Carlyle's widowed mother lived among her children for the remainder of her life, hanging his Army picture over her bed and wearing her Gold Star Mother pin. We all grew up looking at that Army photo. Family reunions included the Virginia War Memorial or the wall in Richmond Memorial Hospital, both of which had his name inscribed. They were the closest thing we had to a grave. We cousins were brought along to bear witness to his sacrifice. My father converted my grandmother's Gold Star Mother pin to a ring which she died wearing. She lived with us for seven years and Carlyle smiled at us daily from her wall. Carlyle was always 'around'. But for 60 years his family was left with a gaping hole, and sparse information about the end of his short 19-year life, until very recently. During Christmas 2004, I was visiting Mom who had just inherited Carlyle's Army photo after not seeing it for 26 years. It was a powerful visit, and his energy seemed to fill the room. I can't explain it, but I had a strong awareness of being charged with telling his story, and if possible, bringing his remains home. Carlyle and his Company are memorialized on The Wall of the Missing at Margraten. 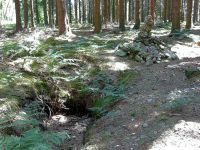 A first-person interview on Scorpio's Huertgen Forest website described the unit's logistics when he became MIA. Lt. Col. Lee Chatfield, Sgt. Robert Driscoll, Capt. John McIndoe and S/Sgt. 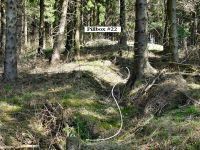 L.F. Cuifo noted Company C captured and held a pillbox before being forced out. Carlyle likely was killed by artillery fire around 5:30 p.m. on October 14, 1944. This news opened the potential for remains recovery. On a business flight in October 2005, I happened to sit next to someone from the Army Human Resources Command. That serendipitous meeting yielded Carlyle's Individ Individual Deceased Personnel File (IDPF), and my mother's and my blood being collected for the DNA Database maintained by the Joint POW/MIA Accounting Command (JPAC). The IDPF contained medical and dental records, height, weight, hair and eye color - even shoe size. Heart-wrenching letters written in my grandmother's hand, pleading for information, were followed by form letter replies. Evacuation and excavation numbers for remains were broken down by area, but we lacked a description of the area in which Carlyle was last seen. After a few more steps I managed to get the Army to reopen Carlyle's case and to assign a Casualty Officer. That November I read a newspaper article in the Richmond Times Dispatch by Alexa Edlund entitled Finding Uncle Bill. It mirrored my efforts, and with her guidance, I wrote for Carlyle's After Action Reports and Morning Reports, yielding a list and a way to search for the 18 MIA's listed within. After much research we narrowed it to four: Privates Clarence Brotherton, Leslie E. Shankles, Walter H. Reuter, and Carlyle. All of them were from Company C and were sought by the Army simultaneously. 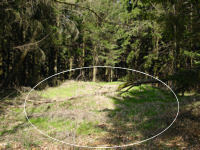 One IDPF mentioned finding five sets of remains on top of the ground in 1948. Each excavation number had its own IDPF. I requested the IDPF of the only set of remains which wasn't later identified: X-5391. Then at a business conference in mid-May 2006, I met Maj. Lisa Pearse, Chief Deputy Medical Examiner of the Office of the Armed Forces Medical Examiner, who oversees the forensics lab where remains are identified. She introduced me to Dr. Tom Holland, Scientific Director of JPAC, requesting that he open a case for Carlyle. Tom introduced me to Dr. Chris McDermott who provides remains recovery field work and coincidentally was departing for excavation of sites in the Huertgen Forest. Chris provided reports of his work and also advised me to register with the Defense Prisoner of War / Missing Personnel Office's Regional Family Update Events. On July 30, 2006, the IDPF for X-5391 arrived, coincidentally rubber stamped with my birthday! The description of these remains bore some physical characteristics to Carlyle's, and also eliminated two of the four others. I sent a copy to Chris to investigate further. In January 2007, through the hurtgen1944.homestead.com website, I met AWONer Gail Eisenhauer whose father, Lt. John C. Eisenhauer, 60th Inf. Regt., 9th Inf. Div., Co. K, died close to the same time and place as Carlyle. Gail provided invaluable help through her networks, introduced me to AWON, and said that she was going to that area in the Huertgen Forest on Memorial Day. The December 2006 issue of World War II magazine yielded important additional logistics. I downloaded Google Earth and studied the area closely. In April 2008, my luck got even better. I was sent to Berlin for a month on a business trip and I knew I had to retrace Carlyle' last steps. JPAC provided their GPS Google Earth map overlay tagged with pillboxes and logistics of the exact area where Carlyle's company was last seen. 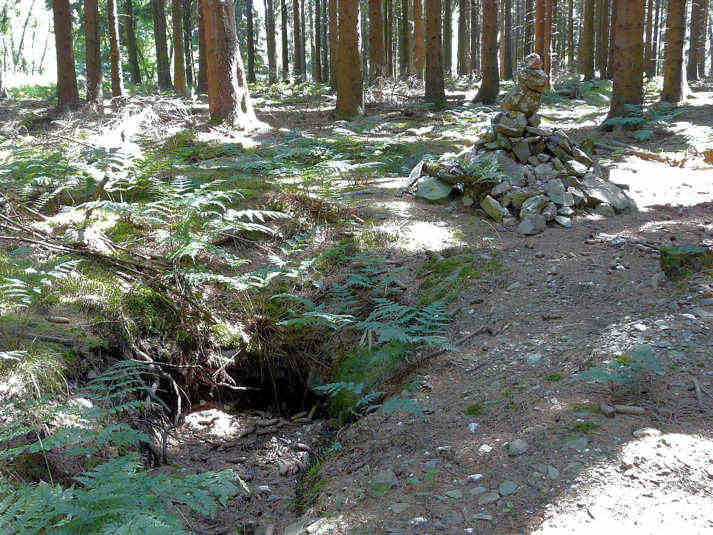 I had no idea of how to locate this spot deep in the woods, six hours away, in a foreign country, without knowing the language. But then I remembered Gail had just been here, so she introduced me to Manfred Klinkenberg of the Huertgen Forest Museum and two other researchers from The Netherlands: Hans vanToer and Henk Didericks. I sent the map overlay to Manfred. Using his GPS, we hiked about a mile into the battlefield which is largely unchanged since the war. Still heavily wooded it was filled with foxholes, metal shards and chunks of cement. 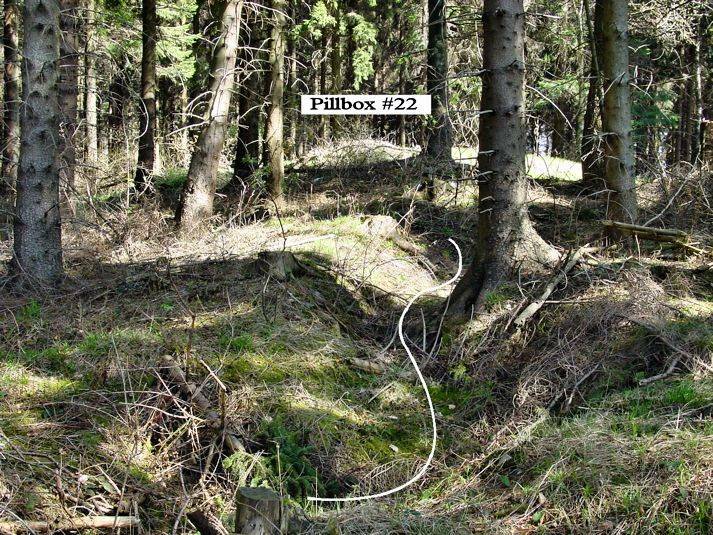 We saw the remains of pillbox #22 described in Chatfield's interview as the one Carlyle likely died defending. Pillbox #22 covered with dirt. 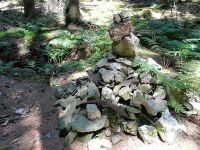 When we arrived at the spot, we discovered a makeshift three-foot tall circular stone monument. At the time, we had no idea what it represented. 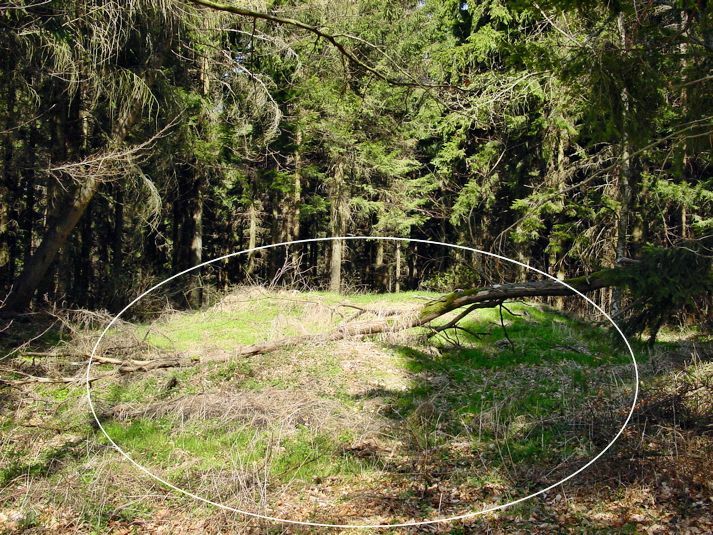 Weeks later, Manfred reported reported that it was built by Hans Peter Kotzan, who while metal detecting, found Pvt. Walter Reuter's dog tags on this spot in 2004. Pvt. Reuter, whose remains are still unrecovered, was also MIA on the same Morning Report as Carlyle. Hans Peter built the monument from the remnants of an exploded pillbox out of respect for Pvt. Reuter. I wondered what Pvt. Reuter's family knew. There aren't words to describe these synchronistic events. It still feels surreal. We called Mom from the spot to share what we had found. She thanked these wonderful gentlemen profusely, and all were deeply overcome with emotion. Though we didn't find his remains, we believe that this is the exact area where Carlyle died, and I was walking in his last steps. At the Ardennes Cemetery I offered a prayer and placed flowers on the grave of Gail's father, and 'unidentifiable' X-5391, likely one of the four from Company C - and dare I say it - perhaps Carlyle. Though JPAC states that we lack sufficient evidence for exhumation, I won't give up, and our case remains open. Last April, cousin Raymond Carlyle Burrows' family welcomed Carlyle's third generation namesake, amazingly, born on his birthday! Carlyle must still be smiling. I keep a small shrine with a chunk of pillbox and his photo nearby. We still hope that his remains are recovered and he's granted the full military funeral and burial in Arlington National Cemetery that he earned. And there's more! On a whim, this Christmas I located Pvt. Reuter's son. 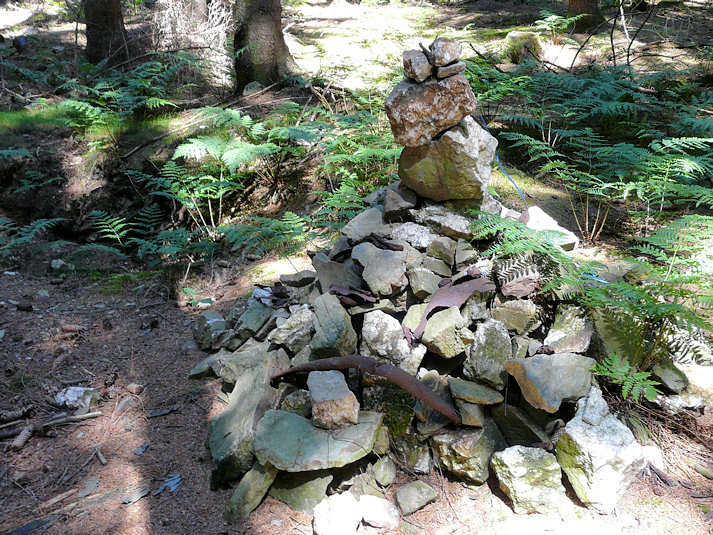 I mailed him his father's IDPF, JPAC reports, and photos of the dog tags and the monument built to him in the Huertgen Forest. He and his two siblings knew little about their father's death, were unaware of these events, and were astounded. I'm now helping to facilitate the return of his father's dog tags via JPAC. Re-posted here by kind permission of Nancy Chimento Fraker.